A logarithm (of the base b) is the power to which the base needs to be raised to yield a given number. then the log of x (base b) equals y. So, for example, using a base of 10 (log10 or log base 10), the logarithm of 1,000 equals 3 because 10 raised to the three equals 1,000.
then the log (base 10) of 1,000 equals 3. The natural logarithm is one of the most commonly used logs in statistics. This logarithm has the constant e as its base ( e = approximately 2.718281828459…). The definite integral of 1 to e of 1/x dx equals one (you don’t need to remember that, just one of the elegant gems of mathematics!!!). The natural log is often written ln(x) and is equivalent to loge(x). Now it’s time for the log rules. 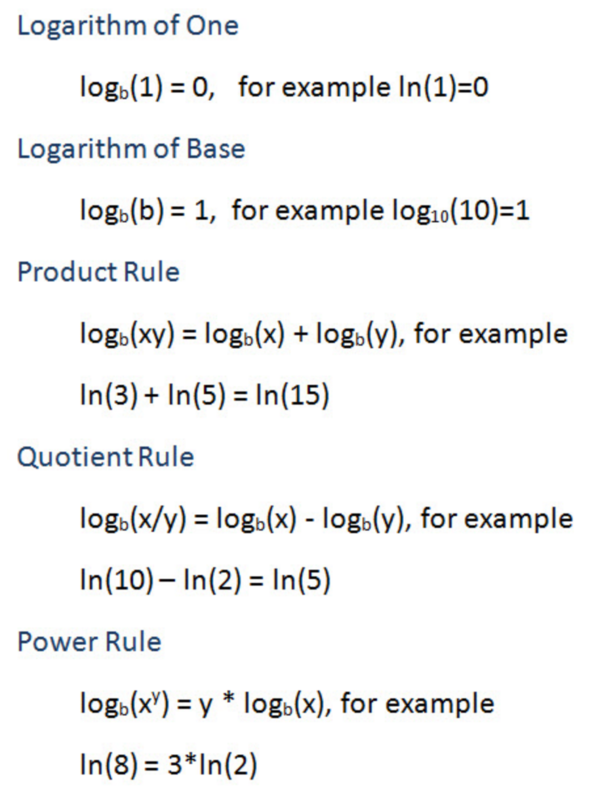 To manipulate logarithms, you should understand and be able to apply the following rules. Remember that ln = log base e (loge). Go to the page on Factorials!! Return to the Basic Math home page. This website was developed by Elizabeth A. Albright, PhD of the Nicholas School of the Environment, Duke University. Follow Elizabeth A. Albright, PhD on Twitter @enviro_prof. If you found these pages useful, please tweet, link to your website or share via Facebook. Thanks!